The M Series Subwoofer line represents PowerBass as a performance and value leader. 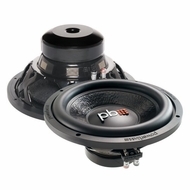 These woofers are designed to deliver rich sounding bass at all volume levels. Check out the high-tech features: 4-layer non pressed paper DDC (Dynamic Damping Coating) finish cone, large roll Santoprene® surrounds which allow free movement of the cone for maximum SPL, a large motor structure for high-power handling, 2” and 2.5” vented BASV Voice Coil formers for optimum performance, and cooling for maximum heat dissipation. For increased operating efficiency a CNC machined one piece backplate and pole plate is used to reduce magnetic losses and maximize air flow keeping the voice coil running cooler. Chrome-plated binding post terminals accept large gauge wire to assure all power from the amplifier reaches the subwoofer. Designed to work optimally in sealed or ported enclosures and either dual or single 4 ohm voice coils for multiple bass applications. Try the mighty M Series today!